This is the height of luxury. Most people's least favorite part of traveling somewhere far away is the journey to get there—but when you're flying in a $21,000 first class airplane seat, the trip itself starts to get a lot more appealing. 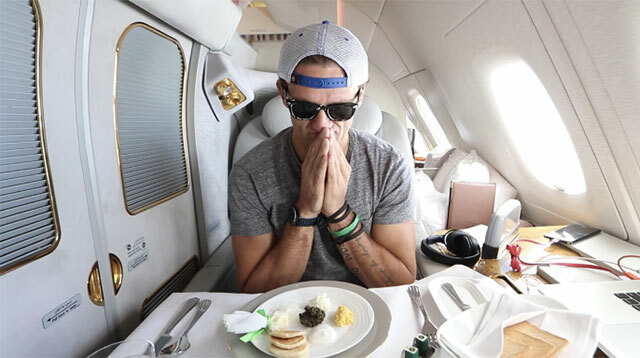 YouTuber Casey Neistat recently got a free upgrade on his Emirates flight from Dubai to New York City, and decided to document his absolutely bonkers experience on what will probably be the most luxurious flight of his life. As he explains in the video, the cheapest first class tickets he could find for similar flights were going for $21,635.30—more than most of us make in a month (or, you know, multiple months)—and Emirates definitely made sure he got his money's worth. Not only did the seat come with a gigantic touch-screen TV and countless hidden goodies, from a personal bar to fancy face creams to a set of pajamas, but it also included five-star service. At one point in the video, when Casey attempted to turn his chair into a bed, one of the flight attendants actually refused to let him do it himself and stepped in to finish the job. In case you aren't yet impressed, all the food on the flight is also made-to-order, and you can have your meals whenever you'd like—including caviar, if you want to feel extra fancy. There's also a huge bathroom with a fully functioning shower, which you can rent out for a half hour. "When I think of the greatest days in my entire life, I think of when my children were born, or perhaps when my son graduated high school, or today, when I was upgraded from Business to First on Emirates," Casey said before boarding the plane. "It really does change your relationship with travel," he said, after getting off of it. Next time, I'm traveling in Casey's suitcase.